Restaurants nationwide are building a longer table, rather than a wall, to stand up for all in their communities. 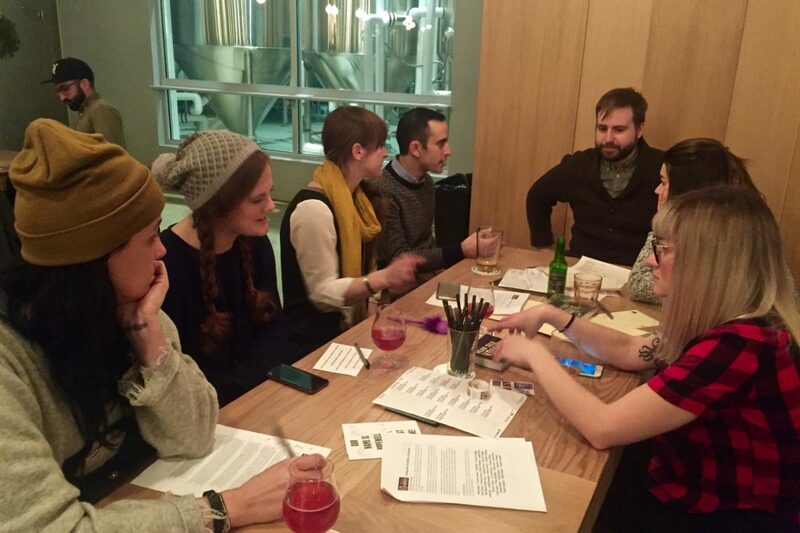 On a recent Thursday, a small crowd gathered at Chicago’s Hopewell Brewing Company. Pens and postcards were piled on the tables, and customers scribbled messages to their senators in opposition to President Trump’s policies on immigration, climate change, and other issues while sipping their favorite lagers. Like many other restaurants in Chicago and around the country, Hopewell has doubled as a space for activism in recent months. Hopewell’s owners made public their commitment to advocacy when, in December, they chose to participate in the nationwide sanctuary restaurant movement. As of yesterday, the sanctuary restaurant movement has officially launched. February 13 was chosen in honor of the federal minimum wage for tipped workers, which is $2.13 per hour, said Sheila Maddali, co-director of the Tipped Worker Resource Center at Restaurant Opportunities Centers (ROC) United. So far, over 250 restaurants have signed on nationally and Maddali anticipates that more will join them in the weeks to come. Sanctuary restaurants offer a place at the table for all and uphold a no-tolerance policy for racism, sexism, homophobia, and xenophobia. The movement is a joint venture of the ROC United, a non-profit organization dedicated to improving wages and working conditions for restaurant workers, and Presente.org, a Latinx organizing group advancing social justice. Unlike sanctuary cities, however, which limit the local government’s cooperation with federal immigration authorities, Maddali said that sanctuary restaurants are not set up to harbor undocumented immigrants. Maddali pointed out that as private entities, restaurants can neither enforce nor change federal law. But she believes they can go a long way toward providing spaces that are free from harassment and hate-speech. Employers must comply with their obligations under immigration law, but they’re being given the legal information they need to help their workers understand their rights. They are also being trained to ask for a warrant and call an attorney if their employees need legal assistance in the coming months. What’s more, ROC is developing a rapid response system for sanctuary restaurants and restaurants workers in need of support while engaging with law enforcement, Maddali explained. If restaurant owners or employees need immediate help with situations that are not life-threatening, they can text “TABLE” to 225568. Maddali said a representative from ROC’s legal department will respond. Members of Restaurants Advancing Industry Standards in Employment (RAISE), an association of restaurant industry leaders convened by ROC, have also signed an open letter to Trump, urging him to pave a path toward citizenship for undocumented immigrants rather than deporting them. Few industries could have served as a better launching ground for the sanctuary movement than the restaurant industry, which relies heavily on immigrant labor. According to a 2015 report from the Bureau of Labor Statistics, 7.1 percent of foreign-born workers are employed in a food preparation and serving related occupation, versus 5.1 percent of U.S.-born workers. A Pew Research Center report from 2012 revealed that 33 percent of undocumented newcomers worked in the service industry, versus 17 percent of U.S.-born workers. The fact that Chicago has become fertile ground for the movement should come as no surprise. A 2010 report from the Census Bureau shows that 32.9 percent of Chicago’s population is Black and 28.9 percent is Hispanic or Latino. Jolanta Lutow, the organizer of the postcard-writing campaign, said that what had begun as a private event on Facebook took off when Hopewell’s owners offered to let her host the event in the taproom. The brewery’s owners also provided postage and helped publicize the event on their social media channels. Lutow, who was born in Poland, said the opportunities she received in the U.S. sparked her desire to help others. The postcard event was part of the nationwide 10 Actions in the first 100 Days campaign, which capitalizes on the momentum from the Women’s March. Hopewell has also donated a portion of its event proceeds to nonprofits like the Illinois Coalition for Immigrant and Refugee Rights (ICIRR) and Women Employed. The business also occasionally offers free meeting space for organizations on Mondays, when the taproom is closed to customers. Like many other small businesses, Hopewell owners are doing their best to support minority groups and provide resources. But Lee acknowledges her company’s limitations. “I see the role of a sanctuary restaurant [as] just being a space where you can find out more information, get involved, ask questions, or we can point people in the right direction,” she said. Similarly, R Public House, a pub in Chicago’s diverse Rogers Park neighborhood, became a sanctuary restaurant in January after owner Reneee Labrana learned that Bistro Campagne, another Chicago restaurant, had joined the movement. For one thing, doing so helped put her employees more at ease, Labrana said. Sandra Carter, a bartender and server at R Public House, said that during her tenure in the restaurant industry, she had always worked alongside Hispanic colleagues. And research backs her up; according to a report from the Economic Policy Institute, restaurant workers are much more likely to be Hispanic than workers in any other industry. “I can’t imagine not standing by them when it comes to immigration,” she said. Carter, who is also partners with Labrana, holds a green card. In early January, R Public House hosted Art Trumps Hate, an event allowing local artists to sell their work and donate a portion of the proceeds to Planned Parenthood. In an effort to support “like-minded” businesses, Labrana said her pub also serves beer brewed by Hopewell. Although there have been occasional negative Yelp reviews about R Public House’s political stance, Carter said the majority of their customers have responded with overwhelming support. Chicago restaurants are eager to participate in the sanctuary restaurant project, Labrana said. Within a week of joining the movement, she noticed the number of sanctuary restaurants in Chicago had grown from three to 11, and she expects that number to continue growing.